First of all, what a gorgeous couple, right? Second- their love for Star Wars is amazing. Any gentlemen reading who want to know how to great a genuine laugh out of their ladies need to take a play from Adam's playbook- make Chewbacca sounds in her ear. For real. It happened, and it worked, and it was perfect. Towards the end of the session I got to meet their sweet dog, Princess Leia, who is also super cute and sweet! 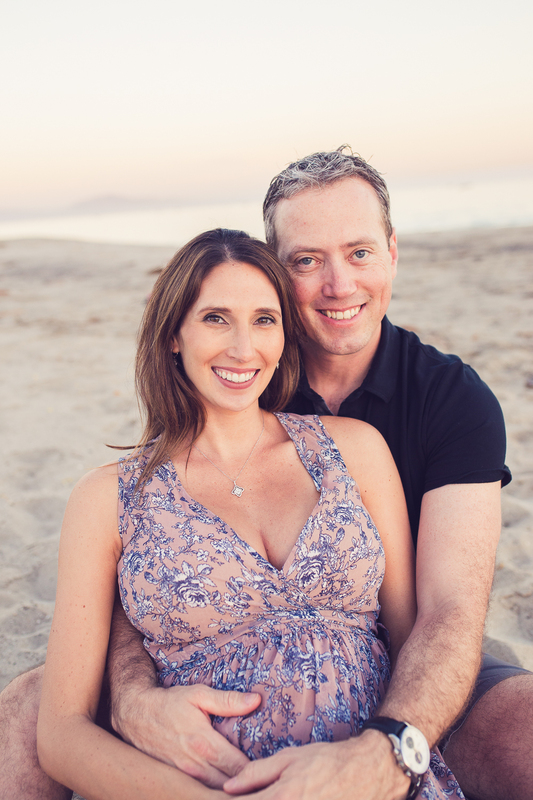 We started their session off at the Fess Parker hotel in Santa Barbara. Chelsea and Adam did their first look for their wedding photos here almost two years to the day of their session. How sweet is that? It was actually my first time at this hotel and it. is. gorgeous. The beach is just across the street and you can see it in their photos on top of the rotunda. Then the beach. The sunset was everything and it matched Chelsea's second dress to perfection. She was such a trooper and got in the water and it was so worth it! I think I say it every session- but the sunset here was one of my favorites! There's just something about a gorgeous mama-to-be, a proud daddy-to-be, a loyal pup, and a stunning sunset, that is just magical.